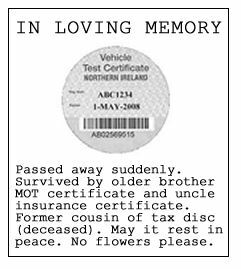 The Northern Ireland MOT disc, the unwanted and much maligned cousin of the considerably older motor vehicle tax disc, has been given the last rites by Mark Durkan, the Northern Ireland Minister for the Environment. From the 4th April 2015, we will finally realign ourselves with the rest of the UK and rejoice at clear, uncluttered windscreens. The writing was on the wall for the Northern Ireland-only MOT disc, once the Chancellor of the Exchequer tore up tax discs. If there was no longer any point to tax discs, it seemed relatively logical to assume that MOT discs would follow suit. In reality, the future of the disc was probably in question for some time. Its fate may have been sealed when vehicle licensing requirements for all UK regions were harmonised with the transfer of the Coleraine-based operations to Swansea in Wales. Introduced in 2003, the MOT disc had an uncertain start to life. Whilst it was merrily issued by MOT centres, it wasn’t actually mandatory for motorists to display the thing. The public didn’t really want it and nobody knew what to do with it. So it sat unloved in glove boxes or kitchen drawers, yearning to be shown off in a £3.99 bushed aluminium-look holder from eBay. Devoid of any discernible colour and stamped with a big date in bold writing, the design of the disc couldn’t have been anymore basic. When discs went missing, no-one worried, because the MOT certificate was king. When the law changed in 2008, the MOT disc earned its official place at the bottom left corner of the windscreen. Not displaying the disc became an offence that could attract a £200 fine and this spawned that triumph of function over form – the double disc holder. Whilst the venerable tax disc racked up 93 years of service and gained, unbelievably, devoted collectors (they call themselves veologists), the poor old MOT disc limped through life as a superfluous inconvenience. Apparently, the most collectable vehicle excise duty discs can command between £200 and £300; the highest price recorded to date is in excess of £800 for a 1921 issued disc. It’s hard to imagine that the now defunct MOT disc will be sought after in the same way. Just when it looked as if the MOT disc would have the windscreen to itself, the end came swiftly and with no great regret. Passed away suddenly. Survived by older brother MOT certificate and uncle insurance certificate. Former cousin of tax disc (deceased). May it rest in peace. No flowers please. They should wipe out the R-plate restriction whilst they are at it! We've been told that the removal of certs will be done centre by centre so you will still get an MOT disc /cert for a short period after the cut off date depending on which centre you go too. Spotted these at the weekend and wondered what it was about. Why "N"? N is for "New Driver" as far as I can gather. Maybe one of the bordererers can confirm. @davecoupe are we right? | Spotted these at the weekend and wondered what it was about. Why "N"? so the anpr cameras are going to be looking for untested cars now i take it ? ?